a pairing made in Heaven! I love that this salon allows you to stay seated in comfort for both mani and pedi. I had two women working on me at the same time. My polish on my nails lasted me without chipping for 9 days…my polish usually chips within 5-6 days. Visit us for happy hour with your BFF or host your next birthday party! This pairing of Wine and Beauty is perfect. In partnership with Bottlecoat we offer a sommelier-selected list of eco-friendly, no-headache old world wines for you to enjoy. And while you’re getting your mani/pedi in San Francisco, be sure to treat yourself to a glass of sommelier-selected wine. ZAZA is the only place in San Francisco you can get the best of both worlds, wine meets spa! 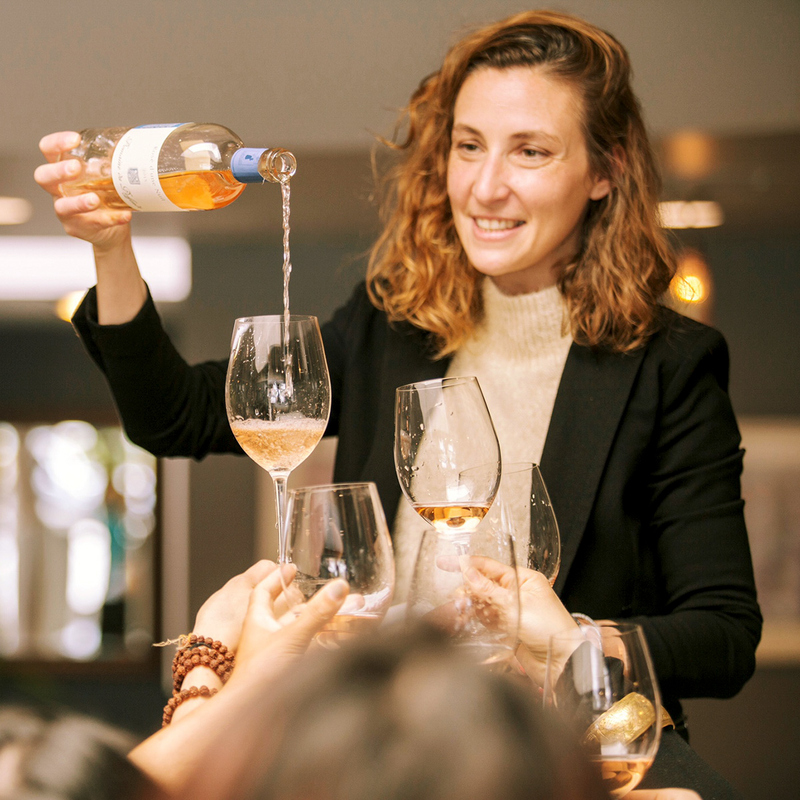 Our wine partner is Oaklandite, Allegra Angelo – sommelier extraordinaire with a degree in biological anthropology and culinary arts, environmentally conscious and obsessed with manicures, pedicures, and no-headache wine. In January of 2016, Rachel met multi-talented sommelier, Allegra Angelo, and they collaborated on a wine and nail pop-up, called “Bottlecoat.” After a year of successful and “too much fun” pop-ups, Allegra grounded her wine roots at ZAZA. Her curated list promotes no-headache and full-proof delicious wines from Europe and California. Together, Rachel and Allegra have connected the elements of wine and hospitality with beauty and wellness, one of its kind in California (and do we dare say, the country?) Where else can you get an eye-lash extension or a coconut pedicure alongside a glass of Grower Champagne followed by an organically certified Rosé from Provence? Oh, and did we mention, there is a wine lounge to chill? Get Polished, Drink Wine.